The question of which color to use for the backpack parts was probably among the first points discussed back when the MEPD was founded. To add to the confusion of a changing color due to different lighting some heavy color filters were used in the Special Edition which came out later in 2011. As you can see, the blueish hue is completely absent in the original version without the filters. 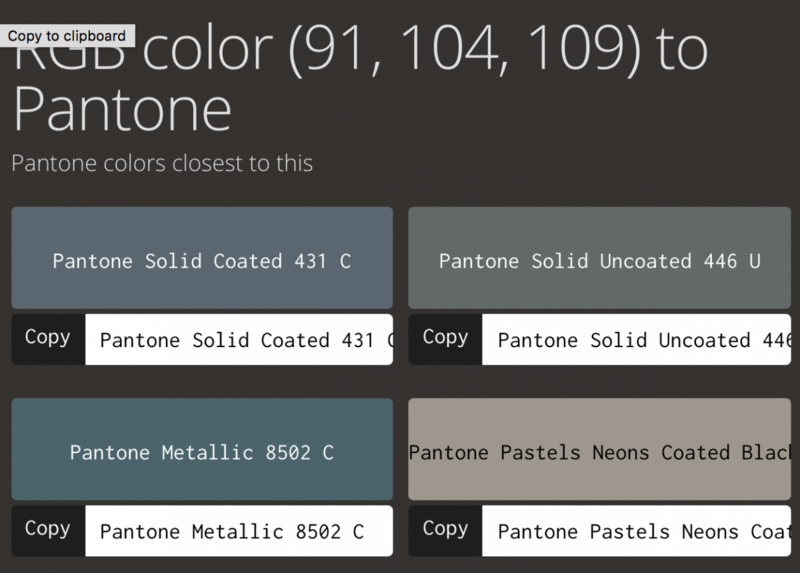 After using some photoshop tools to identify the color and compare it to RAL standard colors I found that the color RAL 7031 resembles the screen used one best and is also named blue-grey and/or battleship gray. 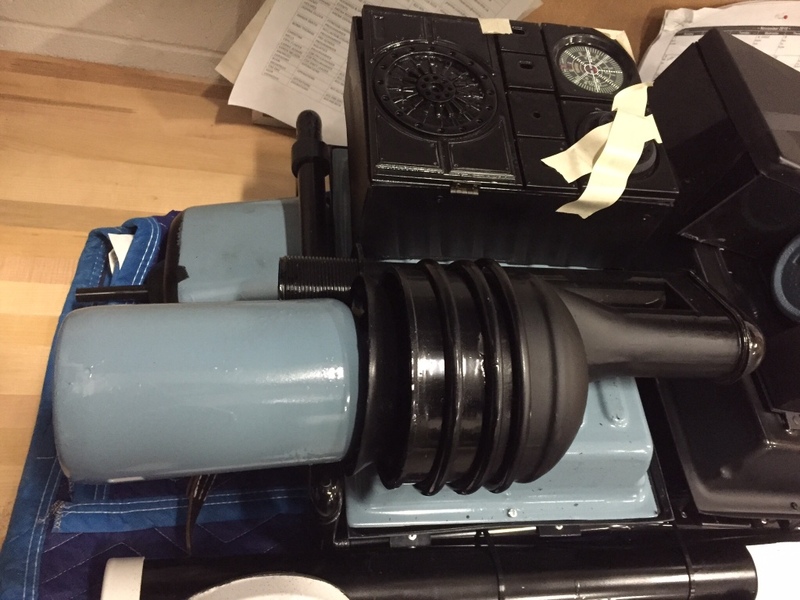 This makes a lot of sense to me since it may well be possible that the new filter brought out more of the blue color of that tone and also it would also make sense that the prop departement used a military color. However, since we have not discovered an original screen used backback yet (and probably never will) this is the current best "educated" guess. Also there are quite a few other colors out there that are very similar to the RAL 7031 color (which is a European standard) so by no means this color should be understood as exclusive. If you're from a part of the galaxy where RAL colors are not available let's hear which colors you have used! This should definitely bring an end to the discussion of which color to use for the backpack parts. I do think the parts were grey originally. Actually, my first pack was painted gray. But then, at the time lots of research was done and we agreed that it would be a blueish grey or greyish blue. Then... we came with the Humbrol research and finally we concurred in the Humbrol 47 blue. Why? Don't know for sure. Many things, maybe we had different sources of info, maybe our screens were not as good (retina vs regular RGB or HD vs SD), also, Blueray Disks versions were not available... And photoshop had less tools than today. Still, we thought grey+blue was the way to go. As you know from our conversation this morning, I am in the process of getting all the vintage parts for a new pack. It will probably take me a few years (LOL) but for me the color is as important as the radio. So this is a great GREAT educated guess, and will be a very important part of that build. 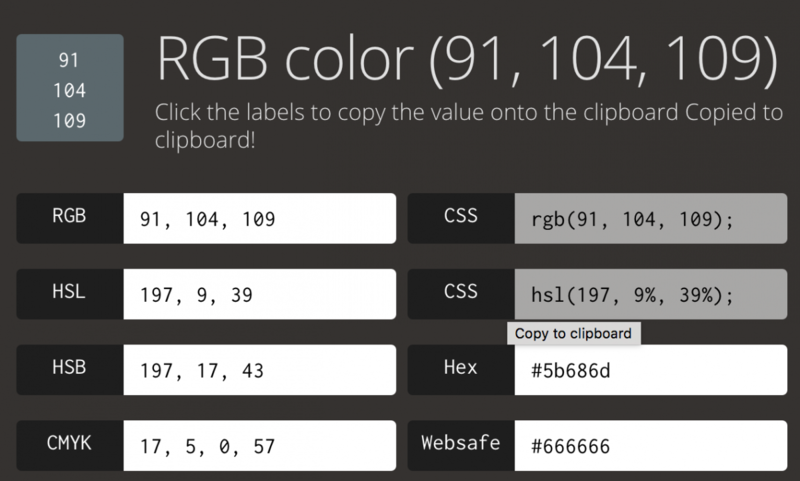 Here are a couple more references trying to uniform the info for all of us around the world, with codes and numbers to convert the color to different platforms and standards. Thanks for getting this off the ground brother!!! Nice to see progress. I definitely agree with the color profile. Which paint out there matches this? I've been to local stores such as Home Depot and I can't find anything close to this. Most likely, any commercial available colours, will be a bit off one way or another. Not sure if anyone has actually done this ? But this is the approach I took. 16 Reference points taken in daylight on various pack parts / Troopers in scenes of ANH and ANH SE. Grouped into a grid then colour averaged in Photoshop. Taking any more than 16 reference points just made the average more 'average' and the results were the same. A little challenge is always welcome I took a similar but less scientific approach. Since you get like 50 different color codes depending on which area of the bottle you take it from I took the color code that matched the original color best IMO. Glad both approaches yielded the same results. I got some Krylon RTA9206 Battleship Gray from Amazon. Hope to have a chance to paint if weather permits this Sunday. I'll take a bunch of photos in different lighting. Great, the color looks pretty good from the outset. Looking forward to your pictures. Would be great to have a good alternative for the US. 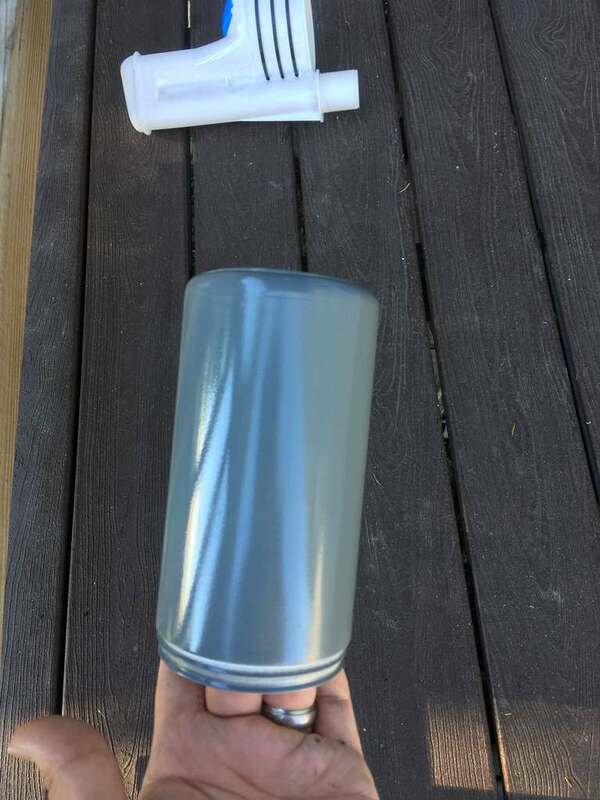 It is definitely gray, almost primer looking. No blue what so ever which is a hard thing to get used to. I am agreeing that lighting played a big factor in making it seem like it was blue. Will have to wait and see when I paint and can play with lighting. 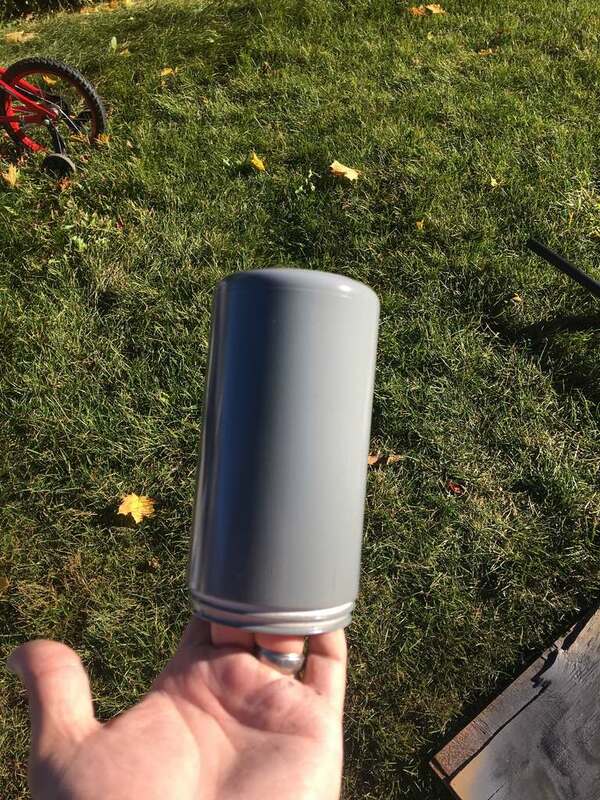 I was going to order some RAL7031 but the only company in the US I could find was charging way too much for one can of spray paint custom made. I've been using this one on all of my pack builds the past few years. "LAKE BLUE". I like it. Very close! Looks good to me. It's missing the blueish hue in direct sunlight but this is something I could live with. The more I look at screenshots and what it looks like it shadow, the more I believe it really wouldn't have made sense for production to use a specialized blue tinted grey. It's hard to really tell though. Definitely not overly blue like people have used for years now though. I'm sticking with what I have and hope whenever I get to apply for SWAT that it's accepted. 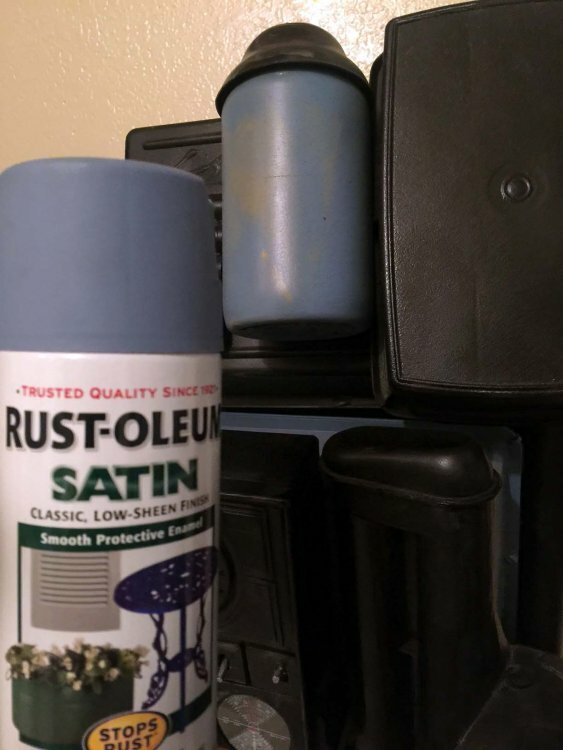 So this is Rustoleum and not the Krylon from Amazon you mentioned above? Sorry, I edited my original post. The battleship grey is Rustoleum enamel. I got it on amazon. Sorry to bump - I was looking through some images of a restoration project on WW2 military vehicle, and looking through images and some Q-panels from a c130. I looked up the requirements for painting vehicles by the military during WW2. In a mention from the US military's FM5 manual dated July of 1944, there is a color listed as "lusterless blue drab". The blue was commonly used on stencils or markings. 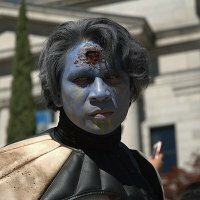 My line of thinking was - The costuming crew seemed to have used a lot of leftover surplus military items, right down to the guns. Is it possible that they may have also used any paint? Also - all this time we have been assuming that the paint used was/is a gloss. This is a matte finish. this is why perhaps the bottles look like two different colors in sunlight and indirect light. A bright blue in sunlight and a grayish blue in indirect light. The paint when delivered to the military was in a paste form. This way it could be mixed in different forumlas for different uses, like on clothing instead of a truck. 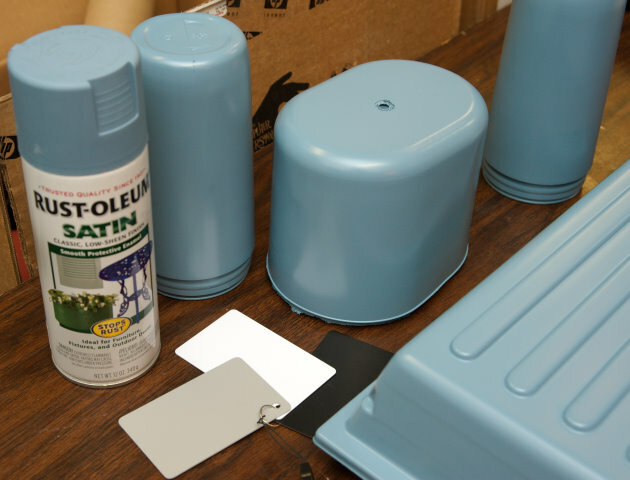 I did order a sample of the paint from a manufacturer who found an original unopened can of the "lusterless blue drab". It arrived. It looks right but not exactly right, because the sample is on metal, not a white plastic bottle. But I do believe I am on to something. When I get around to it - I'll order a spray bottle and test it on different plastics. Also - I hope to look for a British or German military field manual that may have more information of paint. Perhaps the answer to whatever blue this is, is there. 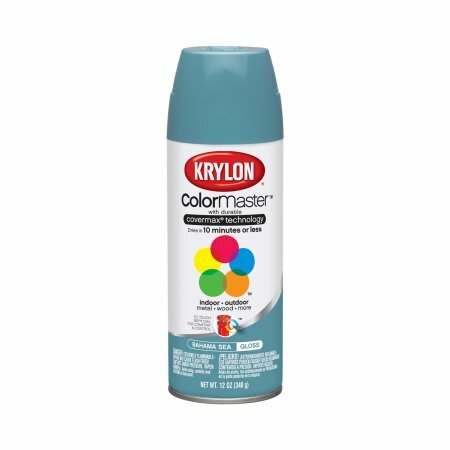 Is the Krylon Bahama Sea passable for the blue gray colour when applying for SWAT? I couldn't find the other suggested colours here in Vancouver. Also, it's glossy. Should I spray it with a clear flat or satin coat if the color is ok? 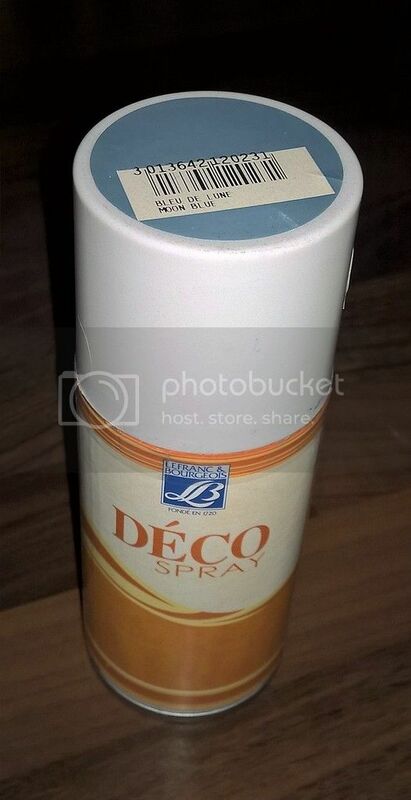 Deo, I think the Krylon paint is a close enough match, although I'm not on the SWAT committee. Looking at the screen captures, there doesn't seem to be a sharp shiny reflection on the paint, so a satin clearcoat should knock down the shine to an acceptable level. The enhancement with the blue color filter may have been heavy handed, and added too much blue to the backpack. 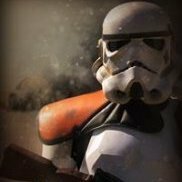 You can also see a hint of blue in the stormtroopers white helmet and armor. So if you dial back the blue just a bit, I think it would still exist in the original paint. Well, I think Fraulein might be on something here. I'm thinking that as they've used many/ several german components/ weapons, could it be a possibility that they've used panzer grey. I have checked several pictures of german vehicles and it's really close I think...I'll try to get my hands on a colour offered by tamiya that is used to paint model kits..